This will be my 4th year gardening in raised beds, and the 3rd gardening in my indestructible concrete block beds! There are many benefits to raised bed gardening, including looser, better draining soil, mitigated risk from toxic and lethal chemicals sometimes found in urban soil, and the fact that they're a bit easier to reach because they're higher up. Gardening in a concrete block garden offers all of these benefits, with the additional perk that concrete blocks will not deteriorate like wood beds will. Especially if you get untreated wood (which doesn't leach chemicals into the soil like treated wood does), you could be looking at replacing your beds in 5-8 years. This is a first step for any garden. In general, if you can find a spot that gets sun or partial sun, that will offer you the greatest options in what you can plant. Other considerations- level terrain, proximity to a water source, visibility, potential for expansion. I chose the left side of my backyard, which faces South & was wide enough for a substantial garden. You can get concrete blocks from major home improvement stores, or smaller hardwares. I purchased 150 concrete blocks for $200 off of craigslist, which included delivery. At Lowes, they're listed for $1/block, so if you can borrow a truck from someone, that's a good bet. I liked that I was re-purposing my blocks though, rather than buying new. This is where you can get a little creative! Beds can be 1 or 2 blocks high, and as long as you have space for. I find that 3-4' wide is a good distance, otherwise it gets hard to reach your plants in the middle, and easy reach is a big benefit of raised bed gardening! I chose sort of an "S" shape initially, to maximize the space I had available. Step 5: Fill beds with compost & Plant away! This is a pretty self-explanatory step- once you get the frame of your beds all laid out and make sure the concrete blocks are level, you can fill in with compost! 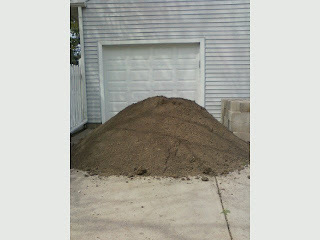 I always fill mine to the top and level them out with a rake- the soil will settle a little bit so be generous. If you have extra soil, you can fill in the concrete block holes as well, and use that space for planting flower, herbs, whatever you'd like! Whether you start small or have visions of grandeur right from the start, concrete blocks are an affordable, sustainable choice for your yard or garden! My family and I also built raised beds this past spring. We have 4 beds, 4X30, for a total of 480 sq. feet. I am curious why you only used compost instead of a mix of compost and dirt. Did the landscape fabric prevent worms from getting into the beds? We used cardboard boxes to try and choke out bermuda grass in our yard and for the most part it has worked. Your work looks good. Good luck. Oh, if you can answer the questions above via email, my email is profpurcell - at - gmail - dot-com. I used layers of wet newspaper on the bottom of the beds, simply to kill the weeds. Why landscape cloth? Just curious. I also dump coffee grounds in my beds to draw in earthworms. Great little composters. You have done great work, it's looking very nice in these pictures, i want to say thanks for sharing this nice idea and the tutorial for it. We're building our cement beds this year. I love the idea of the fabric, but I've opted to use cardboard. It will decompose over time and I have a lot of it available. Nice photos and helpful assistance! Thanks! Concrete block beds are indeed far way better than wooded beads. More sturdy and concrete. I have concrete beds at the backyard and I never had problems with them getting destroyed easily. I have something like this too in my own backyard but it's a smaller area. I'm planning to expand it soon, glad to have these new ideas from this article. Always handled the stuff with care at your home. because if you will fail to do so. it will damage a lot. I love to read your article. This is the perfect blog for those who want to know about this topic. This is the perfect way to do gardens. If you have extra concrete laying around then you might as well use it. This is contributing to the environment too. That is a really creative way to do a garden. The S shape is really smart for being able to reach all parts of the garden. I don't always think about that sort of thing until it is too late. It is amazing what some people can build and create out of something like concrete. Wow! you have done a great work. It seems to me that you are a professional who knows how to build concrete block raised beds. By the way your garden looks great now. Remember to not use cinder-block because it is made with fly ash and other harmful ingredients that can leach into your organic plants. Only use concrete block, it is made with rubble/rock. We have some untreated lumber with a little concrete dried on it. Is it safe to burn? Thank you for sharing your great idea from far afield Sydney Aus. Where can I buy a cheap full sized mattress? How many blocks did you buy per bed. And size bed. Thanks. should i use cinder block? what do you think about fly ash? l benefited a lot from this article and citing it was simple . Start eating locally- Join a CSA this spring!